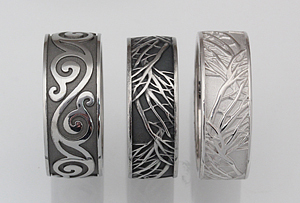 A texture on a precious metal ring is nice, because it holds its shape over time. That is why hand engraving was done so often on the old, vintage, platinum jewelry. Finishes are often superficial, and while they may show wear over time, they are still necessary and beautiful. Most rings and designs can be refinished occasionally to bring back the original luster of the metal. Millegraining is decorative technique in which, historically, a little roller is rolled over edges to give the appearance of tiny round balls. Contemporary millegraining is done two ways: Larger beads are cast in place, for a larger look and a more affordable price (shown on left), or the traditional wheel is used for true millegraining (shown on right). Both can look great! It just depends upon the final look you are trying to achieve. A mirror like finish is created by sanding and polishing with increasingly finer grit. A broad high polish is easily marred in a precious metal. This satin finish is created by sandblasting with tiny glass beads. A superficial finish that, when on the outside of broad surfaces, will easily show marks. This is a great finish for recessed areas. A brushed finish is applied with sandpaper. Again, this is a superficial finish that can show wear over time in precious metals. The wave ring has a black rhodium plating in the background, and the engagement ring shows a before and after, natural white gold then the black gold finish. The color is a charcoal gray, for a low to medium contrast. Because it is actual metal plated onto metal, this will not wear away in a deep recess as shown. As long as the recessed area is low enough to not be rubbed, the plating will remain for a very long time.